THE Acts of the Apostles considered as the first history of the Church may be viewed as typical of all ecclesiastical history. It is in this respect a microcosm wherein, on a small scale, we see represented the triumphs and the mistakes, the strength and the weakness, of God’s elect people throughout all the ages. Thus in the incident before us, embracing the whole of the third chapter and the greater portion of the fourth, we have set forth a victory of the Apostles, their subsequent persecution, together with the blessing and strength vouchsafed in and through that persecution. The time of these events cannot be fixed with any great exactness. They occurred probably within a few weeks or months of the day of Pentecost. That is the nearest we can approach to a precise date. There seems indeed to have been a pause after the excitement and success of Pentecost, and for this we think that we can see a good reason. The Apostles must have had plenty to do with the vast multitude gathered upon the day of Pentecost, striving to lead them into a fuller knowledge of the faith. We are apt to imagine at first sight that supernatural enlightenment was vouchsafed to these earliest converts, superseding any necessity for careful and patient instruction, so that upon their baptism the whole work was completed. But when we reflect upon other cases in the New Testament, we can easily see that the three thousand souls converted by St. Peter’s speech must have needed and received a great-deal of teaching. The Church of Corinth was one of St. Paul’s own founding, and upon it he lavished careful attention for a year and a half; yet we see from his Epistles to the Corinthians how much guidance was needed by them even in elementary questions of morals, how rapidly the Church fell into grossest license when deprived of his personal ministrations. Theophilus again, to whom the Acts were addressed by St. Luke, is reminded, in the preface of the Gospel, of the catechetical instruction in Christian truth which he had received.74 Assuredly, then, the small band of the twelve Apostles and their few male assistants must have had their hands full enough for many weeks after Pentecost, endeavouring to give their converts such an insight into the great principles of the faith as would enable them to carry back to their various distant homes a competent knowledge of the laws and doctrines of the new dispensation. A few moments’ reflection will show that the newlybaptised had much to learn about Christ, -the facts of His life, His doctrines, sacraments, the constitution of His Church, and the position allotted to the Apostles, -before they could be considered sufficiently rooted and grounded in the faith. And if this was so with converts from Judaism, then how much more must such careful instruction after baptism have been found needful in the case of the Gentiles when the time came for their admission? Much preparatory work had been done for the Jews by their Old Testament training. They had not much to learn from the Apostles in practical morality; they had a right conception of God, His character, and His service. But as for the Pagans, their whole intellectual and spiritual life, all their notions and conceptions about God, and life, and morals, were all hopelessly wrong. The Apostles and the earliest teachers had then, and missionaries amongst the heathen have still, to make a clearance of the whole pagan ground, laying a new foundation, and erecting thereon a new structure, intellectual, moral, and spiritual. St. Paul recognised the vast importance of such diligent pastoral work and catechetical training after baptism when writing his pastoral Epistles, because bitter experience had taught him their value. At Corinth for more than two years, and at Ephesus for three years, he had laboured diligently in building up his converts. And notwithstanding all his exertions, how quickly the Corinthians fell away into pagan habits of unbridled license as soon as he left them! 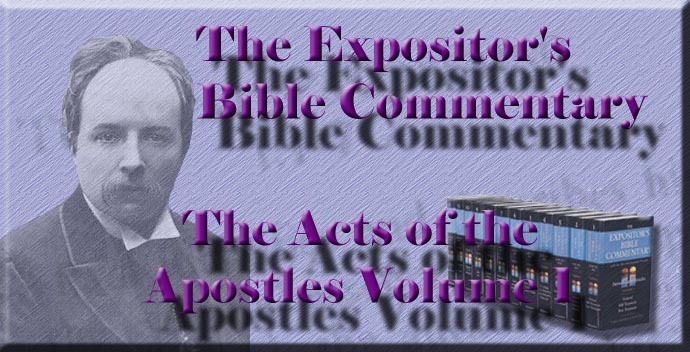 The Acts of the Apostles, by this pause in evangelistic work which we here trace, strikes a note of warning concerning the future missionary work of the Church, speaking clearly about the necessity of diligent pastoral care, and prophesying of the certain relapses into wild excesses which may be expected to occur among those who have only bean just rescued from the mire of paganism. This is one explanation of the pause m apostolic work we here seem to perceive. There are great calm and dignity in nature; and there were great calm and dignity in grace when God was laying the foundations of His kingdom by the hands of His Apostles. There never was an age which more needed this lesson of nature and grace alike than this nineteenth century.76 The religion of the age has been infected by the Spirit of the world, and men think that the fortresses of sin and ignorance will fall, provided there be used a sufficient quantity of noise, of puffing, and of excitement. I do not wish to find the slightest fault with energetic action. The Church of Christ has been in the past perhaps a little too dignified in its methods and operations. It has hesitated, where St. Paul never would have hesitated, to adapt itself to changed circumstances, and has ofttimes refused, like a timorous lawyer, to venture on some new and untried sphere because there was no precedent. The Reformers and their first followers were an illustration of this. The utter lack of missionary spirit and effort among the Reformers is one of the darkest blots upon their history. How sadly they contrast with the Jesuit Society, which started into existence at the same period of the world’s history. No one is more keenly alive to the faults and shortcomings of that world-renowned Society than I am, yet I heartily admire the energy and devotion with which, from its earliest days, the Society of Jesus flung itself into missionary work, endeavouring to repair the losses which the Papacy sustained in Europe by fresh conquests in India, China, and America. The Reformers were so busy in bitter controversies among themselves, and so intent upon endeavouring to fathom God’s decrees and purposes, that they forgot the primary duty of the Church to spread the light and truth which it has received; they were deficient in Christian energy, and thus brought upon themselves the blight and curse of spiritual barrenness. Controversy evermore brings with it the desolation of spiritual leanness. Men cease to really believe in a religion which they only know upon paper, and only think of as a thing to be discussed. Living contact with human souls and human wants saves religion, because it translates it from a mere dead dogma into a living fact. A man who has come to doubt doctrinal statements which he has never verified, will be brought back to faith by the irresistible evidence of sinful lives changed and broken hearts comforted. The Church of England has again and again manifested this spirit. In Ireland she refused to give the nation the Liturgy and the Bible in the Irish tongue. In Wales she hesitated in condescending to vulgar wants, and long refused to bestow a native episcopate upon the Celts of England, because the evil tradition of centuries, down from the age of the Norman conquest, had ordained that no Welshman should be a bishop. But still, while I am opposed to the Church binding itself in fetters of that kind, I am equally of opinion that there is a middle course between dignified idleness and extravagant carnal sensationalism. I have heard efforts advocated for home missionary work which, I am sure, would never have met with the approbation of the first missionaries of the Cross. The Church must be energetic, but the Church need not adopt the methods of quack medicine-sellers, or of the strolling circus. Such methods were not unknown in the primitive ages of the Church. The preachers of the Stoic philosophy strove in the second century to counteract the efforts of the Christian Church by reforming paganism, and by preaching it vigorously. They adopted every means to attract the public attention and interest—eccentricity, vulgarity, coarseness; and yet they failed, and were defeated by a society which trusted, not in human devices and carnal forces, but in the supernatural power of God the Holy Ghost.77 The Montanists again, towards the close of the second century, fell into the same error. The Montanists are in many respects one of the most interesting of the early Christian sects. They tried to retain the customs and the spirit of apostolic Christianity, but they mistook the true methods of action. They confounded physical excitement with spiritual fervour, and strove by weird dances and strange cries, borrowed from the pagans of the Phrygian mountains, to bind to themselves the sweet influences of the Heavenly Comforter. The Church of that period diligently avoided the error of pagan Stoics and of Christian schismatics. As it was in the second century, so was it just after Pentecost. The Church followed close upon its Master’s footsteps, of whom it was said, "He shall not strive nor cry, neither shall any man hear His voice in the streets," and developed in quietness and retirement the spiritual life of the thousands who had crowded into the door of faith which Peter had opened. Again there is a lesson in this period of pause and seclusion, not merely for the Church in its corporate capacity, but for individual souls. The spirit of interior sanctity is nourished most chiefly during such times of retirement and obscurity. Obscurity has indeed many advantages when viewed from the standpoint of the spiritual life. Publicity and high station and multiplicity of affairs bring with them many disadvantages. They deprive us of that peace and calm which enable a man to contrast the things of time with those of eternity, and to value them in their true light. Over-activity, fussiness, even in the most spiritual matters, is a dire enemy of true heart belief, and therefore of true strength of spirit. The Master Himself felt it so. There were many coming and going, and they had no leisure so much as to eat. Then it was He said, "Come ye into the desert, that ye may rest awhile." The excitement and strain of Pentecost, and all the subsequent efforts which Pentecost entailed, must have told seriously upon the Apostles, and so they imitated the Master, that they might renew their exhausted vigour at its primal fountain. How many a man, busy in missions, or preaching, or the thousand other forms which evangelistic and religious work now takes, would be infinitely better if this apostolic lesson were duly learned. How many a terrible scandal has arisen simply from a disregard and contempt for it. If men will think they can labour, as this passage shows the Apostles could not, without thought and reflection, and interior communion with God; if they will spend all their strength in external effort and never make time and secure seasons for spiritual replenishment, they may create much noise for a time, but their toil will be fruitless, and if they are saved themselves it will only be as by fire. The period of retirement and obscurity came, however, to an end at last. The Apostles never intended to form an order purely contemplative. Such an idea, in fact, never could have entered into the mind of one of those early Christians. They remembered that their Master had expressly said, "Ye are the salt of the earth," and salt is useless if kept stored up in a vessel by itself, and never applied to any object where its curative properties might have free scope. When the spirit of Eastern gnosticism, springing from the dualism of Persia, invaded the Church, and gained a permanent hold within it, then men began to despise their bodies and life, and all that life entails. Like Eastern fanatics, they desired to abstract themselves as much as possible from the things and duties of the present, and they invented, or rather adopted from the farther East, purely contemplative orders, which spent useless lives, striving, like their prototypes of India, to rise superior to the positions which God had assigned them. Such were not the Apostles. They used rest, contemplation—they did not abuse them; and when their tone and power were restored, they issued forth again upon the field of religious activity, and joined in the public worship of the crowd. "Peter and John went up together into the temple at the hour of prayer, being the ninth hour." But in those earliest days of the Church the Apostles naturally could not recognise the course of the Divine development. They cherished the notion that Judaism and Christianity would be found compatible the one with the other. They had not yet recognised what St. Stephen first of all, and then St. Paul, and most chiefly the author of the Hebrews, came to recognise, that Judaism and Christianity as full-blown systems were absolutely antagonistic; that the Jewish dispensation was obsolete, antiquated, and must utterly fade before a nobler dispensation that was once for all to take its place. It is hard for us to realise the feelings of the Apostles at this great transition epoch, and yet it is well for us to do so, because their conduct is full of lessons specially suited for seasons of transition. The Apostles never seem to me more clearly under the direction of the Divine Spirit than in their whole course of action at this time. They proceeded in faith, but not in haste. They held firmly to the truths they had gained, and they waited patiently upon God, till the course of His providence showed them how to co-ordinate the old system with the new truths, -until He had taught them what parts of the ancient covenant should be dropped and what retained. Their conduct has instruction very suitable for the present age, when God is giving His Church fresh light on many a question through the investigations of science. Well, indeed, will it be for Christian people to have their hearts grounded, as the Apostles’ were, in a spirit of Divine love, knowing personally in whom they have believed; and then, strong in that inner revelation of God to the spirit, which surpasses in might and power all other evidences, they may patiently wait the evolution of His purposes. The prophetic declaration is true for every age, "He that believeth will not make haste." The circumstances of the first apostolic miracle were simple enough. Peter and John were going up into the temple at the hour of the evening sacrifice. They were entering the temple by the gate well known to all dwellers at Jerusalem as the Beautiful Gate, and there they met the cripple whom they healed in the name and by the power of Jesus of Nazareth. The spot where this miracle was performed was familiar to the Jews of that day, though its precise locality is still a matter of controversy. Some hold that this Beautiful Gate was one described by Josephus in his "Wars of the Jews" (5:5, 3) as surpassingly splendid, being composed of Corinthian brass, and called the Gate of Nicanor. Others think that it was the gate Shushan, which stood in the neighbourhood of Solomon’s Porch; while others identify it with the gate Chulda, which led into the court of the Gentiles. It was most probably the first of these which was situated on the eastern side of the outermost court of the temple, looking towards the valley of Kedron.79 Here was gathered a crowd of beggars, such as then frequented the temples of the pagans as well as of the Jews, and such as still throng the approaches of Eastern and many Western churches. Out of this crowd one man addressed Peter and John, asking an alms. This man was well known to the regular worshippers in the temple. He was a cripple, and one long accustomed to haunt the same spot, for he was above forty years old. Peter replied to his prayer in the well-known words, "Silver and gold have I none, but what I have, that give I thee. In the name of Jesus of Nazareth, walk"; and then he performed one of the few miracles ascribed to the direct action of St. Peter. Here it may be asked, Why was this miracle of healing the cripple at the temple gate the only one recorded of those earliest signs and wonders wrought by apostolic hands? The answer seems to be threefold: this miracle was typical of the Church’s future work; it was the occasion of St. Peter’s testimony before the Sanhedrin; and it led up to the first persecution which the Jewish authorities raised against the Church. Viewing the Acts of the Apostles as a type of what all Church history was to be, and a Divine exposition of the principles which should guide the Church in times of suffering as well as in times of action, we can see good and solid reasons for the insertion of this particular narrative. First, then, this miracle was typical of the Church’s work, for it was a beggar that was healed, and this beggar lay helpless and hopeless at the very doors of the temple. The beggar typified humanity at large. He was laid, indeed, in a splendid position, -before him was extended the magnificent panorama of hills which stood round about Jerusalem; above him rose the splendours of the building upon which the Herods had lavished the riches and wonders of their gorgeous conceptions, -but he was nothing the better for all this material grandeur till touched by the power which lay in the name of Jesus of Nazareth. And the beggar of the Beautiful Gate was in all these respects the fittest object for St. Peter’s earliest public miracle, because he was exactly typical of mankind’s state. Humanity, Jew and Gentile alike, lay at the very gate of God’s temple of the universe. Men could discourse learnedly, too, concerning that sanctuary, and they could admire its beauteous proportions. Poets, philosophers, and wise men had treated of the temple of the universe in works which can never be surpassed, but all the while they lay outside its sacred precincts. They had no power to stand up and enter in, leaping, and walking, and praising God. It is very important, in this age of material civilisation and of intellectual advance, that the Church should insist vigorously upon the great truth taught by this miracle. The age of the Incarnation must have seemed to the men of that time the very acme of civilisation and of knowledge; and yet the testimony of all history and of all literature is that just then mankind was in the most deplorable state of moral and spiritual degradation. The witness of St. Paul in the first chapter of the Epistle to the Romans is amply borne out by the testimony, conscious and unconscious, of pagan antiquity. A writer of the last century, now to a great extent forgotten, Dr. Leland by name, investigated this point in the fullest manner in his great work on the necessity of a Divine revelation, demonstrating that mankind, . even when highly civilised, educated, cultured, lies like a beggar at the door of the temple, till touched by the hand and power of the Incarnate God. This miracle of healing the beggar was typical of the Church’s work again, because it was a beggar who thus received a blessing when the Church roused itself to the discharge of its great mission. The first man healed and benefited by St. Peter was a poor man, and the Church’s work has ever led her to deal with the poor, and to interest herself most keenly in their wellbeing. This first miracle is typical of Christian work, because Christianity is essentially the religion of the masses. At times, indeed, Christian teachers may have seemed to rank themselves on the side of power and riches alone; but then men should take good care to distinguish between the inconsistent conduct of Christian teachers and the essential principles of Christianity. The founder of Christianity was a carpenter, and its earliest benediction pronounced the blessedness of those that are poor in spirit, and ever since the greatest triumphs of Christianity have been gained amongst the poor. Christian hagiology, Christian legend, and Christian history alike, have combined to attest this truth. The Church calendar is decorated with lists of saints, some of them of very doubtful character, while others of them have stories connected with their careers full of meaning and rich with lessons for this generation. Thus, for instance, October 25th is the feast of a martyr, St. Crispin, from whom the great trade of shoemakers is designated. "The sons of St. Crispin" is a title going back to the earliest ages of the Church’s love. St. Crispin was a Roman senator, brought up and nourished amid all that luxury with which pagan Rome surrounded the children of the highest classes. Crispin became acquainted with the faith of the followers of the Carpenter of Nazareth amid the dire persecutions which marked the final struggle between Christianity and paganism under the Emperor Diocletian during the earliest years of the fourth century. He was baptised, and feeling that a life of gilded idleness was inconsistent with his Master’s example, he resigned his place, position, and property, retired into Gaul, and there devoted himself to the trade of shoemaking, as being one which could be exercised in great quietness. Manual toil was at that time considered an occupation fitted only for slaves, for we ought never to forget that the dignity of labour is no human invention, nor is it part of the religions of nature. Nay, rather, the dignity of idleness was the doctrine of Greek and Roman paganism. St. Crispin recognised the great law of labour taught by Christ and taught by His Apostles, and became the most successful of shoemakers, preaching at the same time the gospel with such success that the persecutors selected him as one of their earliest victims in that district of Gaul where he resided.80 It has been just the same in every age. The true power of the Church has been ever displayed in preaching the gospel to the children of toil. An interesting example of this may be gathered from an age which we are apt to think specially dark. In mediaeval times the secular or parochial clergy became very lax and careless throughout these islands. The mendicant friars, the followers of St. Francis, came and settled everywhere in the slums of the great towns, devoting themselves to the work of preaching to the poor. And they speedily attained a marvellous power over men. The Franciscans in the thirteenth century were exactly like the early Methodists in the last century. Both societies placed their chapels among the abodes of want; there they laboured, and there they triumphed, because they worked in the spirit and power indicated by this first recorded miracle of the beggar healed at the temple gate.81 It will be a bad day for religion and for society when the Church ceases to be the Church and champion of the weak, the downtrodden, the destitute. Here, however, lies a danger. Its work in this direction must be done in no one-sided spirit. Christianity must never adopt the language or the tone of the mere agitator. I fear that some who now pose as specially the champions of the poor are missing that spirit of mental balance and fairness which will alone enable them to be Christian champions, because seeking to do justice unto all men. It is easy enough to flatter any class, rich or poor; and it is specially tempting to do so when the class so flattered chances to hold the reins of political power. It is very hard to render to all their due, shrinking not from telling the truth, even when unpleasant, and reproving the faults of those whose side we favour. A Christianity which triumphs through appeals to popular prejudices, and seeks a mere temporary advantage by riding on the crest of popular ignorance, is not the religion taught by Christ and His Apostles. "Homo sum; humani nihil a me alienum puto." We think, furthermore, that this miracle has been divinely recorded because it was the occasion of St. Peter’s testimony both to the people and to their rulers. Let us strive to realise the circumstances and the locality. Peter and John, going up to the temple, met this impotent beggar at the entrance to the Court of the Women, into which the Beautiful Gate led. Our modern notions about churches confuse all true conceptions concerning the temple. The vast majority of people, when they think of the temple, form to themselves an idea of a vast cathedral, when they ought instead to think of a large college, with square succeeding square and court following court. As Peter and John ascended the temple hill they came first to the Court of the Gentiles, which served as a market and in which a crowd of mendicants were assembled to solicit alms. Out of this Court of the Gentiles the Beautiful Gate led into the Court of the Women, which was reserved for the ordinary religious offices of the Jewish people.82 One of the beggars addressed the Apostles, soliciting a gift; whereupon the Apostles worked the miracle of healing. Upon this a crowd collected, attracted by the excited conduct of the man who had received such an unexpected blessing. They ran together after the manner of all crowds which assemble so easily and so rapidly in a city, and then hurrying into the cloister called Solomon’s Porch, which was a remnant of the ancient temple, heard the address of St. Peter. It must have been a spot filled with cherished memories for the Apostle. Every Jew naturally venerated this cloister, because it was Solomon’s; just as men in the grandest modern cathedral still love to point out the smallest relic of the original structure out of which the modern building new. At San Clemente, in Rome, the priests delight to show the primitive structure where they say St. Clement ministered about the year A.D. 100.83 At York the vergers will indicate far down in the crypt the fragments of the earliest Saxon church, which once stood where that splendid cathedral now rears its lofty arches. So, too, the Jews naturally cherished this link of continuity between the ancient and the modern temples. But for St. Peter this Solomon’s Porch must have had special memories over. and above the patriotic ideas that were linked with it. He could not forget that the very last feast of the Dedication which the Master had seen on earth, He walked in this porch, and there in His conversation with the Jews claimed an equality with the Father which led them to make an attempt on His life. Here, then, it was that within twelve months the Apostle Peter makes a similar claim on his Master’s behalf, in a discourse which extends from the twelfth to the twenty-sixth verse of the third chapter. That discourse has two distinct divisions. It sets forth, first, the claims, dignity, and nature of Christ, and then makes a personal appeal to the men of Jerusalem. St. Peter begins his sermon with an act of profound self-renunciation. When the Apostle saw the people running together, he answered and said, "Ye men of Israel, why marvel ye at this? or why look ye so earnestly on us, as though by our own power or holiness we made this man to walk?" The same spirit of renunciation appears at an earlier stage of the miracle. When the beggar solicited an alms, Peter said: "Sliver and gold have I none: but what I have, that give I thee. In the name of Jesus Christ of Nazareth, walk." One point is at once manifest when St. Peter’s conduct is compared with his Master’s under similar circumstances. St. Peter acts as a delegate and a servant; Jesus Christ acted as a principal, a master, -the Prince of Life, as St. Peter calls Him in the fifteenth verse of this third chapter. The distinction between the miracles of Christ and the miracles of the Apostles declares the New Testament conception of Christ’s dignity and person. Compare, for instance, the narrative of the healing of the impotent man at the Pool of Bethesda, told in the fifth chapter of St. John, with that of the healing of the impotent man laid at the temple gate. Christ said, "Rise, take up thy bed, and walk." He made no appeal, He used no prayer, He invoked no higher name. He simply spake and it was done. The Apostle Peter, the rock-man, the leader of the apostolic band, takes the greatest care to assure the multitude that he had himself neither power nor efficacy in this matter, and that all the power lay in the name of Jesus Christ of Nazareth. Now, leaving aside for the moment any question of the truth or reality of these two miracles, is it not manifest from these two parallel cases that the New Testament writings place Jesus Christ on an exalted standpoint far above that of any human being whatsoever; in a position, in fact, which from the boldness and magnificence of its claims can only be fitly described in the language of the Nicene Creed as "God of God, Light of Light, Very God of Very God." St. Peter’s words teach another lesson. They are typical of the spirit which should ever animate the Christian preacher or teacher. They turn the attention of his hearers wholly away from himself, and exalt Christ Jesus alone. And such has ever been and ever must be the secret of successful preaching. Self-consciousness, in fact, injures the effect of any kind of labour. The man who does not lose himself in his work, of Whatever kind — political, philanthropic, or religious—his work may be, but is everthinking of himself and the results of his actions upon his own prospects, can never become an enthusiast; and it is only enthusiasm and enthusiastic action which can really affect mankind. And surely the preacher of Christian truth who thinks of himself rather than of the great subject of his mission, who only preaches that he may be thought clever or eloquent, debases the Christian pulpit, and must be an awful failure in that day when God shall judge the secrets of men by Jesus Christ. St. Peter here, John the Baptist in still earlier days, ought to be the models for Christian teachers. Men came to the Baptist, did him homage, yielded him respect; but he pointed them from himself to Christ. He was a lamp, but Christ was the light; and the Baptist’s teaching reached its highest, noblest level when he turned his disciples’ gaze away from himself, saying, "Behold the Lamb of God, which taketh away the sin of the world." Let me, however, not be mistaken. I do not mean to say that a Christian teacher, whether writer or speaker, should never allow a single reflex thought as to his own performances to rise in his mind, should never desire to preach ably or eloquently. A man who could set up such a standard must be ignorant of human nature and of Scripture alike. One cannot, for instance, read St. Paul’s Second Epistle to the Corinthians without noting how sorely he was touched by his own unpopularity amongst them and the successful machinations of his opponents. Daily experience will prove that no attainments in the spiritual life will prevent a man from valuing the esteem and recognition of his fellow men. But such a desire to please and be successful must be kept in stern control. It must not be the great object of a Christian. It must never lead him to keep back one jot or tittle of the counsel of God. The natural desire to please must be closely watched. It easily leads men to idolatry, to the installation of human fame, power, influence, gold, in the place of that Eternal Saviour whose worship ought to be the great end and the true life of the soul. St. Peter, after his act of abnegation and self-humiliation, then proceeds to set forth the claims and to narrate the history of Jesus Christ, and in doing so enters into the particulars of His trial and condemnation, which he charges boldly home upon his listeners, who, as distinguished from his audience on the day of Pentecost, were most probably the permanent residents in Jerusalem. The Apostle narrates the events of our Lord’s trial just as we find them in the Gospels—His interviews with Pilate, the outcry of the people, the choice and character of Barabbas. He asserts His resurrection, and implies, without asserting, His ascension, by the words, "Whom the heavens must receive until the times of the restitution of all things." The primitive gospel of St. Peter was just like that taught by St. Paul, as he puts it forward in the fifteenth chapter of First of Corinthians, "Brethren, I declare unto you the gospel which I have received, how that Christ died for our sins according to the scriptures: and that He was buried, and that He rose again." The earliest message, proclaimed by St. Paul or St. Peter, was one and the same; it was a declaration of certain historical facts, and what it was then such it must ever remain. Whenever the historical facts are disbelieved, then men may speak beautifully of the spiritual ideas and the moral truths symbolised by Christianity, just as Hypatia and the Neo-Platonists of Alexandria could speak in picturesque language concerning the deep poetic meaning of the old pagan legends. Poetry and legends are, however, the veriest husks wherewith to support an immortal soul under the great trials of life; and when that day comes for any soul when the great historical facts set forth in the Creed are rejected, then Christianity may remain in name and appearance, but it will cease to be the gospel of joy and peace and comfort, for the human soul can only sustain itself in the supreme moments of sorrow, separation, and death by the solid realities of fact and truth. St. Peter, again, in this sermon leaves us a type of what Christian sermons should be. He was plain-spoken, yet he was tender and sympathetic. He was plain-spoken. He does not hesitate to state the crimes of the Jews in the most vigorous language. God had glorified His servant Jesus, but they delivered Him up to the agents of the idolatrous Romans; they denied Him, desired a murderer to be granted in place of the Prince of Life; urged His death when even the Roman judge would have let Him go, -and all this they had done to the long-expected and long-desired Messiah. Peter is not wanting in plainness of speech. And the Christian teacher, whether clergyman or layman, whether a pastor in the pulpit, a teacher in the Sunday-school, or the editor of a newspaper at his desk, ought to cultivate and exercise the same Christian boldness and courage. The true Christian ideal will be attained by following St. Peter’s example on this occasion. He combined boldness and prudence, courage and gentleness. He spoke the truth in all honesty, but he did not adopt an attitude or use language which would arouse unnecessary opposition. What courtesy, what sympathetic, charitable politeness is manifest in St. Peter’s excuse, which he offers in the course of his sermon for the Jews, rulers and people alike! "And now, brethren, I wot that through ignorance ye did it, as did also your rulers." Some men think that prudence is an idea which should never enter the head of a messenger of Christ, though no one impressed more frequently the necessity of that great virtue than did the Master, for He knew how easily imprudence may undo all the good that faithfulness might otherwise attain. Wisdom like the serpent’s, gentleness like the dove’s, was Christ’s own rule for His Apostles. Boldness, and courage, and honesty, are blessed things, but they should be guided and moderated by charity. Earthly motives easily insinuate themselves into every man’s heart, and when a man feels urged on to declare some unpleasant truth, or to raise a violent and determined opposition, he should search diligently, lest that while he imagines himself following a heavenly vision and obeying a Divine command, he should be only yielding to mere human suggestions of pride, or partisanship, or uncharitableness. The apostolic manual called the Teaching of the Twelve Apostles , to which we have already referred, proves that the Church of the Apostles' day required catechisms and introductory formularies just as much as we do. Sonnet by Matthew Arnold on Rural Work. This line of thought has been already touched upon in Lect. IV., pp. 61-3. This episode in the history of paganism in the second century is very little known. It has been well depicted in an interesting little book, The Age of the Antonines , by the Rev. W. W. Capes, M.A., which only costs a couple of shillings. Chap. VIII. should specially be consulted. See the article on Barcochba in the Dict. Christ. Biog. , vol. i. See Lightfoot's Horæ Hebraicæ , Acts iii. 2. De Voguë in his great work on the Temple of Jerusalem, fully gives the traditions which attached themselves to this gate. In the fourth century it was celebrated by the Christian poet Prudentius, and in the fifth or sixth a gate called the Golden Gate was erected on its site. This gate still remains, and De Voguë in his plates vii. to xii. gives a series of views of it. The story of St. Crispin is told at length by the Bollandists in the Acta Sanctorum for October, vol. xi., pp. 495 to 540. St. Chrysostom in one of his orations paints a vigorous picture of two imaginary cities, one where all the people were rich, with an abundance of slaves, and therefore dependent on others for all the necessaries and conveniences of life; the other city inhabited by none but poor freemen, where everyone laboured at manual toil and provided for his wants by his own exertions. He then asks which is the happier; unhesitatingly giving the palm to the city of poverty, labour, and freedom. The analogy I have drawn between the early Methodists and the Franciscans will be amply borne out if one will take the trouble, in any of our large towns, to notice where the Franciscans have left traces of their existence. The name Francis Street and the ruins of Franciscan foundations will almost always be found just outside the original walls, among the slums of the people. This point is noticed by Mr. Brewer in his interesting introduction to the Monumenta Franciscana , in the Rolls Series. He says, on p. xvii, "In London, York, Warwick, Oxford, Bristol, Lynn, and elsewhere, the Franciscan convents stood in the suburbs and abutted on the city walls. They made choice of the low, swampy, and undrained spots in the large towns, amongst the poorest and most neglected quarters." The Franciscans proved that splendid material structures are not necessary for great spiritual triumphs. An investigation of the topography of our older towns would show exactly the same great truth about early Methodist chapels. They were almost always placed in poor localities, as the name of Preaching Lane, often still connected with them, shows. See my Ireland and the Anglo-Norman Church , pp. 331-34, for more on this point. See Lightfoot on the Court of the Women in his Chorography of the Holy Land , chap. xix. in his Works , vol. ii., p. 29. The best modern description will be found in Count de Voguë's Le Temple de Jérusalem , pp. 53-6 (Paris, 1864), with which may be compared a paper on the site of the Temple by Colonel Warren in the Transactions of the Society of Biblical Archæology, vol. vii., pp. 308-30. In the new edition of Clement of Rome , by Bishop Lightfoot, vol. i., pp. 92, 93, there is an account of this ancient church.